Like many people my age, I have fantasized about traveling back in time and giving advice to my younger self. To stop young Stephen on a street corner, and say, “Break up with her, you idiot. Haven’t you noticed that she’s nicer to the dog? !” Or “Buy real estate!” Or, “For God’s sake, don’t buy real estate!” Or “under no circumstances should you wear white jeans. Even on a cruise. Also, don’t go on a cruise.”… But I doubt my younger self would even listen to me. I’m sure he’d say “There’s no way you could be me. I have a chin.” Plus, young me would never respect old me. he’s in the theater. I’m a total sellout. So to recap: I’m going to try to give you, who for all intents and purposes are me 25 years ago, some advice that I probably won’t get right, and you probably won’t listen to. Ready? OK: you have been told to follow your dreams. But – What if it’s a stupid dream? 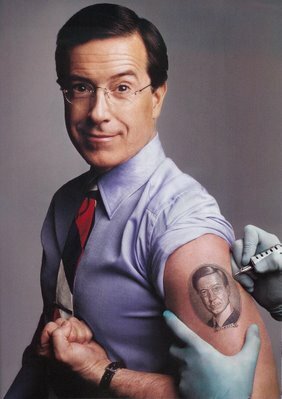 For instance Stephen Colbert of 25 years ago lived at 2015 North Ridge – with two men and three women – in what I now know was a brothel. He dreamed of living alone – Well, alone with his beard – in a large, barren loft apartment. Lots of blond wood, wearing a kimono, with a futon on the floor and a samovar of tea constantly bubbling in the background, doing Shakespeare in the street for the homeless. Today, I am a beardless, suburban dad who lives in a house, wears no-iron khakis, and makes Anthony Wiener jokes for living. And I love it. Because thankfully dreams can change. If we’d all stuck with our first dream, the world would be overrun with cowboys and princesses. So whatever your dream is right now, if you don’t achieve it, you haven’t failed, and you’re not some loser. But just as importantly–and this is the part I may not get right and you may not listen to–if you do get your dream, you are not a winner. After I graduated from here, I moved down to Chicago and did improv. Now there are very few rules about improvisation, but one of the things I was taught early on is that you are not the most important person in the scene. Everybody else is. And if they are the most important people in the scene, you will naturally pay attention to them and serve them. But the good news is you’re in the scene too. So hopefully to them you’re the most important person, and they will serve you. No one is leading, you’re all following the follower, serving the servant. You cannot win improv. But if we should serve others, and together serve some common goal or idea — for any one of you, what is that idea? And who are those people? In my experience, you will truly serve only what you love, because, as the prophet says, service is love made visible. If you love friends, you will serve your friends. If you love community, you will serve your community. If you love money, you will serve money. And if you love only yourself, you will serve only yourself, and you will have only yourself. In closing, I’d like to apologize for being predictable. The New York Times has analyzed the hundreds of commencement speeches given so far in 2011, and found that “love and “service” were two of the most used words. I can only hope that because of my speech today, the word “brothel” comes in a close third. 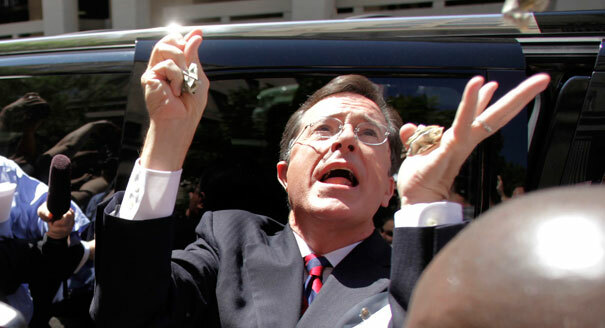 Colbert is describing what we might call an environment of grace as opposed to law. That is, what life looks like when scorekeeping has–miraculously–been put on hold. It’s rare, but maybe you’ve experienced it (you know if you have). Despite the soft appeal at the end, the wisdom found a few paragraphs earlier remains: an environment like this cannot be commanded into existence. It is the fruit of love. Colbert is describing what we might call an environment of grace as opposed to law. What life looks like when scorekeeping has been put on hold. It’s rare, but maybe you’ve experienced it (you know if you have). I know I did for a weekend last month! !